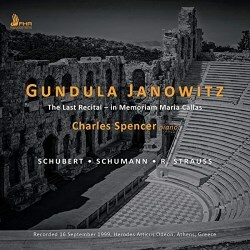 This recital has been issued almost 20 years after it was given to mark two things: the 40th anniversary of the death of Maria Callas and the 80th birthday of Gundula Janowitz. Janowitz’ voice has always seemed to me to be one the great voices of the second half of the 20th century. It had great purity, but not the milksop purity of many English sopranos whose sound is so described. There was a shimmer of vibrato which gave life and character to the purity and a metal centre to the voice which precluded any impression of “little me” girlishness. Although the timbre of the voice suggested that it would comfortably go well above the stave, in fact, like that of Victoria de los Angeles, it was not really at ease above B flat or B natural. Given her chosen repertoire, this was not any great problem; she stuck almost exclusively to German roles in opera and to Lieder, neither of which generally inhabit the vocal stratosphere. She was not an overtly passionate singer and was most successful in roles whose character had either a certain hauteur or simplicity; in Fidelio she was a Marzelline rather than a Leonore (though she did sing Leonore), and, for me, her greatest roles were the great ladies of Strauss - the Marschallin, Arabella, the Countess in Capriccio and Ariadne. Ariadne was the only role I saw her sing live, at Covent Garden in 1985 (though I made sure that went to all three performances she sang). By this stage she could no longer sing it with the perfection that she had in the 1969 Kempe recording, but there was still enough left to make it a treasured memory. She gave her last operatic performance, also as Ariadne, in Vienna in 1990 and final public appearance at the age of 62 in the recital contained on this CD. Janowitz’ Lieder singing was more in the style of the pre-War singers than her immediate predecessors’. You will not find the psychological probing of a Schwarzkopf or a Fischer-Dieskau in her Lieder, but rather the lovely line of an Elisabeth Schumann. This is not to say that her singing was characterless or insensitive, but she did not use what John Steane termed an “interventionist” approach. You will not find the detailed, specific colouring of individual words of Schwarzkopf, but neither will you find her sometimes “precious” over-interpretation and occasional vocal ungainliness. However it cannot be denied that Janowitz’ Lieder can lack depth. This recital begins with a group of Schubert songs. She nicely pays a little tribute to the venue of the recital by beginning with three songs with ancient Greek settings, but in so doing she draws attention to her deficiencies. Almost all the rest of the recital consists of songs whose emotional content is essentially simple and, so to speak, “one note”, but these three songs demand greater drama and contrast than she gives. “Die Götter griechenlands” is well sung, and the instrumental precision of the intervals, for example at “Kehre wieder” in the first line, is wonderful. There is also a sensitive shading at “Schatten” in the last line, but the song really needs a greater sense of melancholy at the loss of the ancient gods. In “Iphigenia” more drama and anguish are needed; little is made of the “mighty waves Crashing against the cliffs”. “An die Leier” is best, with some effective contrast between the first and second pairs of lines in each stanza. The lack of drama in the martial references is seen again the middle stanza of “Ellens Gesang 1”; greater use of the consonants would have helped a lot. The remaining five songs in this Schubert section are more emotionally straightforward and therefore more successful, with lovely tone and legato, though even here in “Der Lindenbaum” the minor key stanzas are insufficiently differentiated. The Schumann section is more consistently good. There is more involvement in “Lied der Suleika” and some beautiful shading at the ends of the second lines of each stanza and the last line of stanza two, “Im Gewande der Poesie”, is exquisitely phrased. “Lotosblume” is nicely moulded, but the last line’s reference to love’s pain is a little bland. In “Meine Rose”, the first stanza should have a greater resonance when it is repeated at the end, but does not. However “Der Nussbaum” is a perfect vehicle for Janowitz and her performance is quite lovely. The Strauss set is, to my mind, the most successful of all. Janowitz’ voice has by now fully warmed up, and she uses a much wider dynamic range. “Das Rosenband” in very fine and we hear some real engagement in “Allerseelen”; the last line of stanza one has exactly the sense of ecstasy needed. “Morgen” and “Nachtgang” have a lovely legato, but “Befreit” is a little too slow for its own good and as a result lacks momentum. However, it does have real passion and a very wide dynamic range and in terms of pure singing is probably the most successful item in the recital. The encore is Schubert’s “Die Forelle”, which is lovely, but Janowitz is completely untroubled by the fate of the fish! Charles Spencer’s accompaniments are fine. They don’t perhaps have the subtlety and perception of a Vignoles or a Martineau, but they are never less than musical. The booklet tells us that as “the recital took place in an open air theatre, a significant amount of external noise was captured, including motor vehicles and passing planes… Most of the noises, some of which were very intrusive, have been removed, though at times the result is an unavoidable compromise of the quality of the remastered audio”. Well, all I can say is that they must have done an exceptional job, because I was not troubled a single time by any untoward noise or noticed any compromised sound. The recording is, of course, not up to the highest standards (it was simply made as an archive document, with no intention of its being issued) and the upper frequencies are a little shrill at times with slight distortions on occasional climaxes, but I cannot believe anyone will find it in any way unacceptable. Vocally, Janowitz was in remarkable fine fettle in this recital. Only in direct comparison with herself in her prime 20 years before would anyone feel that there was any deficiency. When Christa Ludwig retired at almost the same age, I asked her after her Wigmore Hall farewell recital why she was retiring when she still sang so wonderfully; she said, “That is why I am retiring now”. I am sure that Janowitz’ reason was exactly the same. She may not have been the most profound of singers, but the delight that is to found in the sound of her voice and its solid musicality is something cherishable, and still to found in abundance in this final recital.